Cyclists failing to wear an approved bicycle helmet face a fine of $100 and potential serious injury or death if they crash or someone crashes into them. Police have seen an increase in the number of youths and adults not wearing bicycle helmets. This is concerning as it is blatantly obvious to a parent if their youth is riding a bike without a helmet. Cyclists performing potentially dangerous stunts in skate parks have also been witnessed not wearing helmets. 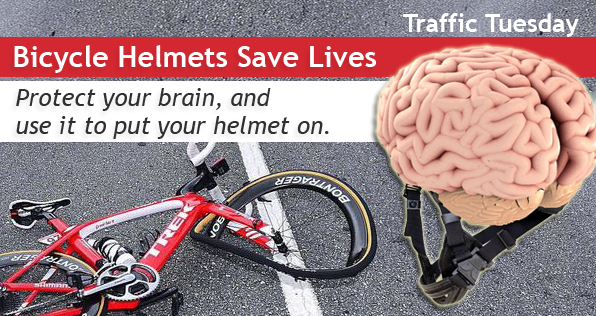 Protect your brain, and use it to put your helmet on. This page -- https://www.police.tas.gov.au/what-we-do/traffic-policing/traffic-tuesday/11-bicycle-helmets/ -- was last published on February 21, 2017 by the Department of Police, Fire and Emergency Management.